This month of Halloween, I’ve heard on the blogosphere many comments about how much fun it is to dress up, and when do you ever get to do that, if not on Halloween? I want to show by s ome pictures that you can make plenty of opportunities for costume-making and wearing, while pretty much ignoring Halloween. You can have a costume party, plain and simple, as a young woman I know does yearly. One year several pirates attended. We had at least one birthday party that was a costume party. I asked the parents not to send the children in Halloween themes, and one came as a witch anyway, but it didn’t detract from the fun the other children children had impersonating a bunny or Bo-Peep. The cowgirl was the guest of honor. 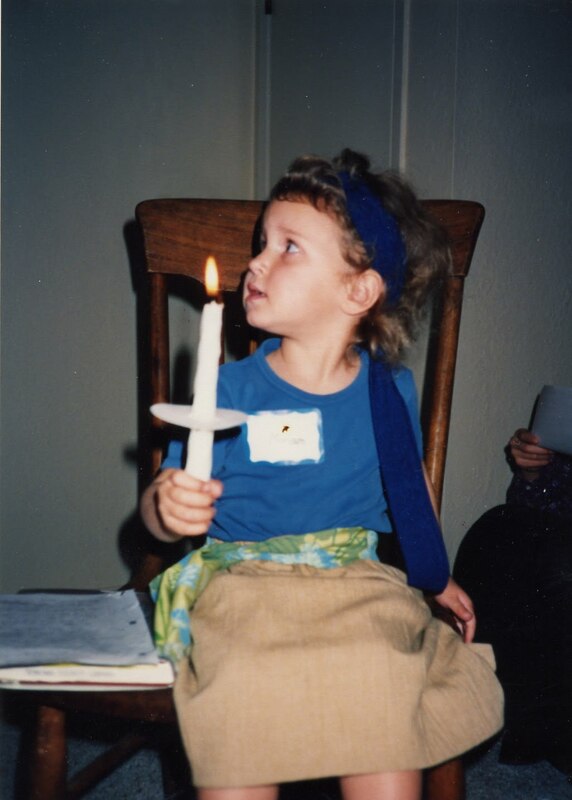 Along with a few other homeschooling families, we used to organize International Meals periodically, where each parent and child attending would not only bring a typical dish of his chosen nation, and give a brief report on that country, but would dress in an often makeshift costume. < This brother and sister were representing Scotland. Our most inspiring costume event, though, was the yearly Cloud of Witnesses Day. This was my invention that expanded on Reformation Day festivities held by some fellow homeschoolers. October 31st happens to be the date that Martin Luther posted his 95 Theses on the Wittenburg door, so dressing up as Reformation characters was a very appropriate and educational activity. Even then I didn’t take to the idea of narrowing our study of our forefathers and moth ers in the faith to that particular era and group of Christians, so I devised a celebration of the “cloud of witnesses” mentioned in the Book of Hebrews. We enjoyed a simple meal of soup and bread together, while remembering those in prison for their faith. Reports were given on the characters each had chosen. Miriam, pictured here, was able to say, “I am Miriam. I take care of my baby brother Moses.” Joseph was excus ed from having to give a report. Over the years we had re-enactments of Bible stories in which each member of one family would take a character, as in “The Macedonian call” story. Once a couple of parents took on the characters of Martin and Katharine Luther; Martin expounded on his theology and Katharine on the more practical aspects of their married life. 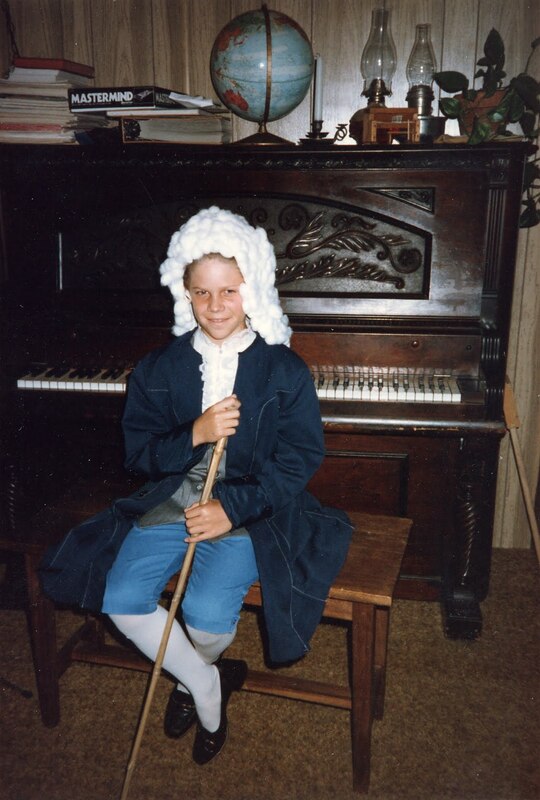 One boy made a wig with cotton balls so he could look more like Johann Sebastian Bach. I worked symbolism into all the evening’s activities, such as milk and honey to remind us of the sweetness of Christ. Justin Martyr, at left, had tea with his cookies instead, at the end of the program. Everyone held candles ( an unusual treat for our Protestant children) while we sang hymns and songs about the Church and how our lights and strength combined are brighter and mo re powerful than alone. It’s obvious in hindsight that in all my talk of the theoretical “universal” church, and wanting us to see ourselves as part of the historic family of faith, I was longing for the Orthodox Church and didn’t know it. 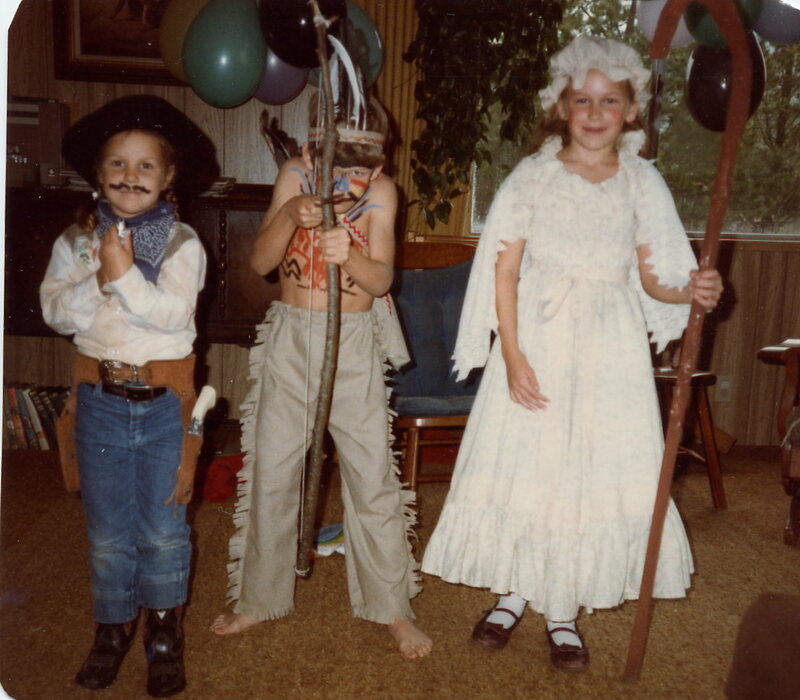 Even so, everyone had a great time learning a little better what the Church is, by having this costume fun together. Little Joseph looks as if he already knows that coat of many colors is going to get him in some temporary troubles and give him enormous future responsibilities. I hope many young families find your blog and are encouraged and inspired. You were so wise to give more than your children might have thought was being taken away from them. what fun! One year we participated in a literature based history co-op and the kids dressed up several times for dinner night. 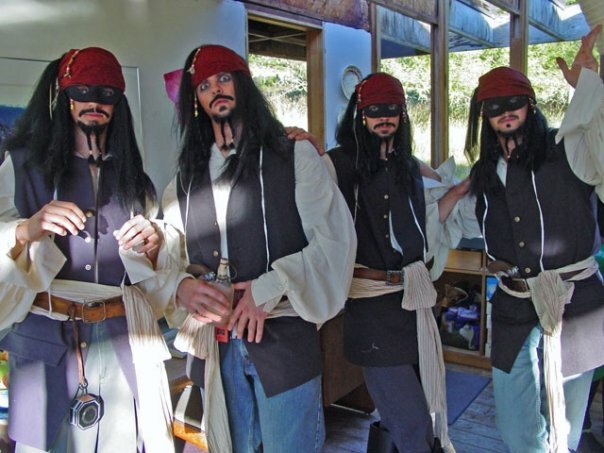 Ren Faires are also a nice excuse to dress up – however many other faire attendees aren't usually as modestly dressed. And you're right about b-day parties. We've done that too… especially princess parties. Lots of good memories. Halloween is not such a big deal here in the UK – but is becoming VERY commercialised, with much emphasis on the witches/spooks aspect of it, which I find hard to handle, as a Christian. This is not quite to the cloud-of-witnesses level… but Mollymae and I perfected and used our Cat in the Hat-inspired Thing 1 and Thing 2 costumes yesterday. We were wearing more (and prettier) clothing than most everyone else at the costume party. Much fun! I do remember cloud of wintesses being incredibly educational and fun… I never much missed Halloween. I've been reading the OT lately–doing studies on Kings and Jeremiah (with the aid of books by Eugene Peterson, who I've taken on as my teacher via his books), and I feel like I'm part of a very big, very old, ongoing story. It hadn't occurred to me to dress up while I'm reading, but wouldn't it be a fun way to make the Bible come to life? Looking at your pictures, I'd say so! p.s. I like the idea of pirates being part of the cloud of witnesses. You never know, do you? I've always wanted to host Christmas party and ask all guests to dress as though they were characters from A Christmas Carol.